IDF Intel's next-generation 'Eaglelake' chipset family, due for release next year, will feature a built-in data protection engine with the ability to encrypt all the files on your hard drive, the chip giant announced this week. It calls the engine 'Danbury'. 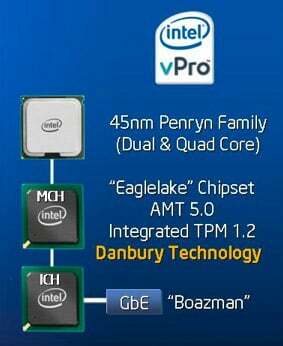 Together with an chipset-integrated Trusted Platform Module, Danbury will be part of Eaglelake chipsets for vPro-branded PCs. It'll be part of the third generation of vPro, codenamed 'McCreary', which will also feature Intel's Advanced Management Technology (AMT) 5.0. Danbury provides a hardware encryption engine for drive-level data security. The encryption keys are created and maintained within the chipset itself, so there's no need to place them in memory where they could be accessed by malware. Danbury ties into the TPM, which is one reason why Intel plans to move that module into the chipset packaging. Plenty of desktop and laptop PCs already contain a TPM, implemented as a separate chip. Integrating it will help reduce system costs. It'll be left to software to provide a front end to all this for the user, Intel said, presumably through utilities and the operating system. McCreary is scheduled to ship in the second half of 2008.